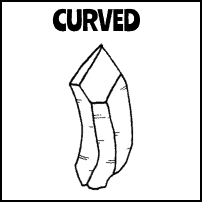 Curved crystals have a shape or sides that are curved. This happens when the crystal is forming and it is a rare occurrence. Sometimes just the sides are curved; sometimes the whole crystal looks bent. Sometimes crystals are self-healed into a curved or bent form. Curved crystals have a gentle, yet powerful energy. They can be used to cleanse the aura. Curved crystals help promote a flexible attitude. 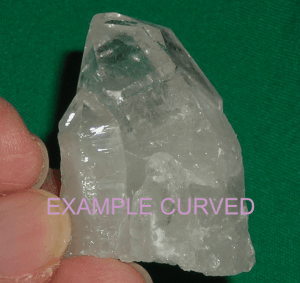 Amazing Arkansas quartz crystal point with a Curved shape, Self Healing and Bridges, dense with Fairy Frost.